Ladies and Gentleman, I’d like to introduce a great friend and colleague of mine…Dr. Jay Waxman. He graduated dentistry in 1987 from McGill University in Montreal and practices dentistry in a nearby suburb, Dollard des Ormeaux. If you or anyone you know needs a dentist in Montreal, I wholeheartedly recommend him. You can reach Dr. Waxman at 514-683-2010. My practice is located in a suburban area of Montreal. It’s a growing community which means lots of young families. Each summer the kids are out of school and are usually pretty active. This usually means our office can count on a handful of dental traumatic injuries. While I hope you never have to deal with this in your family, here are a few helpful tips on what you can do just in case. First and foremost, ensure there are no other serious injuries that would require a hospital emergency visit. If the injury is isolated to the teeth, here’s what you can do. 1) For a tooth that has become loose or displaced from its original position See your dentist as soon as possible. The tooth can often be repositioned by making a small splint. The tooth is placed back to its original position and a wire is then bonded from the displaced tooth to the teeth on either side of it. This enables the tooth to heal and firm up. The splint is removed about 2 weeks later. a) Look for the broken piece and if you find it, bring it with you to the office. Try to keep it in milk and come over as soon as possible. In some cases, the piece can be bonded back to the tooth. I have actually done this a couple of times and in one case the patient has had the fragment attached and it has been over 10 years! b) In most cases however, the tooth fragment is not found and if it is, we don’t usually bond it back on. The way we treat this, is to use a tooth colored filling material (a resin called composite) to build up where the tooth has fractured. When finished, you can barely tell that there was a fracture. However seeing that the tooth is now built up with quite a bit of filling material, I do tell the patient to be very careful with it, as it is now quite fragile. 3) The scariest traumatic dental injury is having a tooth knocked right out Don’t panic, first, find the tooth, handle it with care, and touch only the ‘crown’ portion…this is the part of the tooth that is covered with enamel i.e., that you can see in the mouth…try not to touch the root. It would be ideal if you could gently clean and rinse the tooth and attempt to re-insert it into the empty socket. Then have the patient bite on clean gauze or cloth to help keep it in place. If the tooth can’t be re-inserted, the next best scenario would be to place it under your tongue . This is because the root is most compatible with the saliva in your mouth. If not kept under your tongue, transport the tooth in milk, and see the dentist as soon as possible. Milk is the optimal liquid to place the root in, because it is the most compatible with the tiny microscopic fibers that are attached to the root. The goal is to be as careful with the root portion of the tooth as possible. The shorter the period of time the tooth is out of the mouth the better chance for a successful re-implantation…so time is of the essence. More importantly, ask your dentist about fabricating a form fitting mouth guard for your kids, especially if they are active in contact sports, etc. It’s an inexpensive way to avoid a needless injury. If you or your child has suffered a dental injury, Call Dr. Robert Axelrad, Brampton’s Gentle Dentist for the best in emergency dental care at (905) 791-3867. 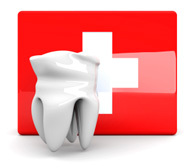 Our emergency dentists can provide immediate relief.